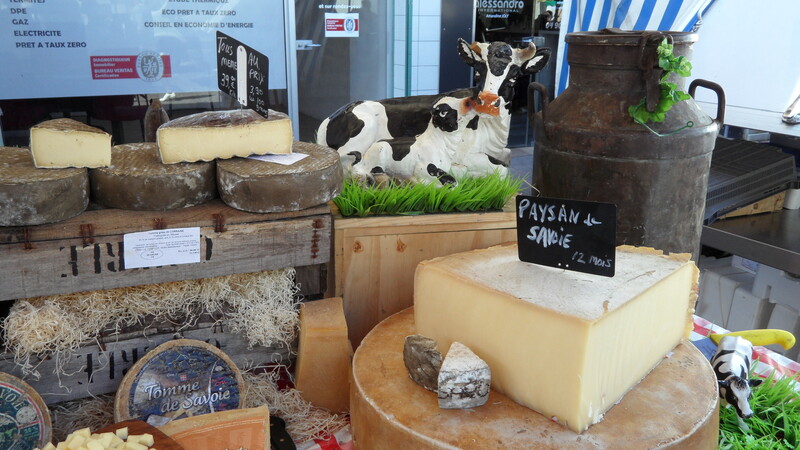 One of my favorite things to do in France is to visit the local markets, each one with their own personality. 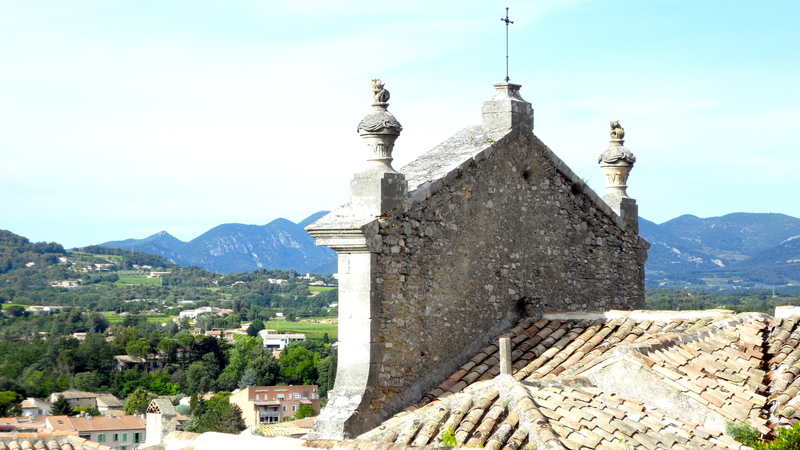 Just north of here lies Vaison la Romaine, home of one of France’s oldest – dating back to 1483 – and largest markets with over 450 vendors. 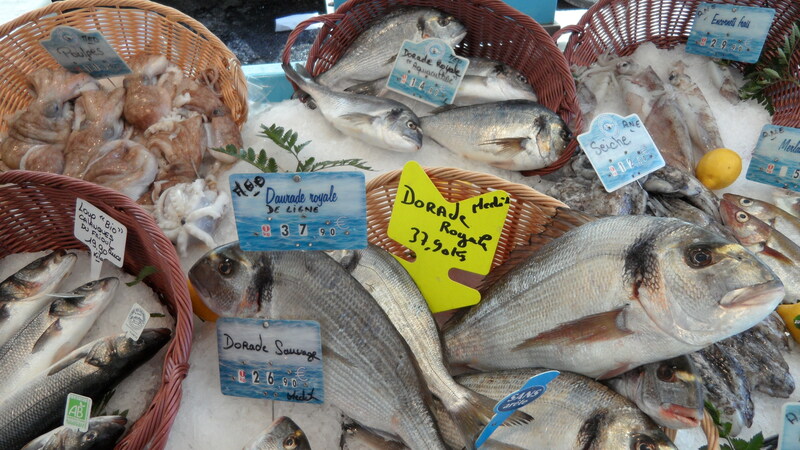 This true reflection of Provençal life stands out as my favorite market so far. Lavender is my favorite and it fills the air. 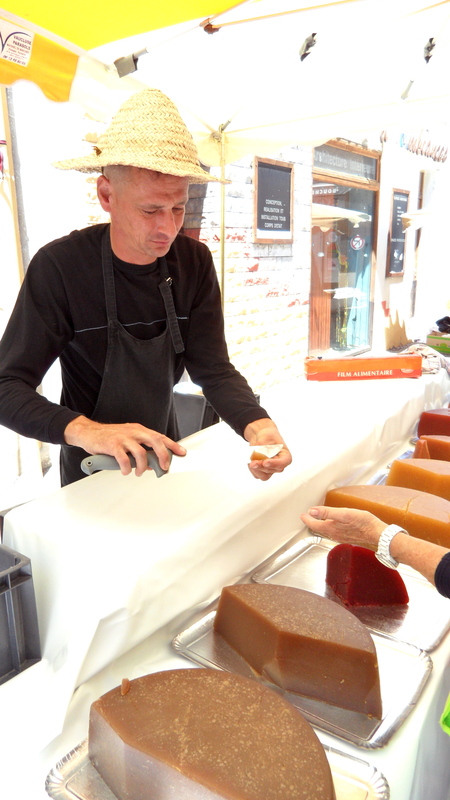 This artisan creates pâté des fruits which look like giant jello. Fresh fruits and organic sugar are cooked at a low temperature until just the right consistency is achieved. Small slices of the gelee are served with coffee, cheese, cookies or to accompany a dessert. At his suggestion, we tried the ginger pâté with chevre and the spiciness with the tangy cream was divine. This special confiture comes at a price. Two small slices were 20 Euro! 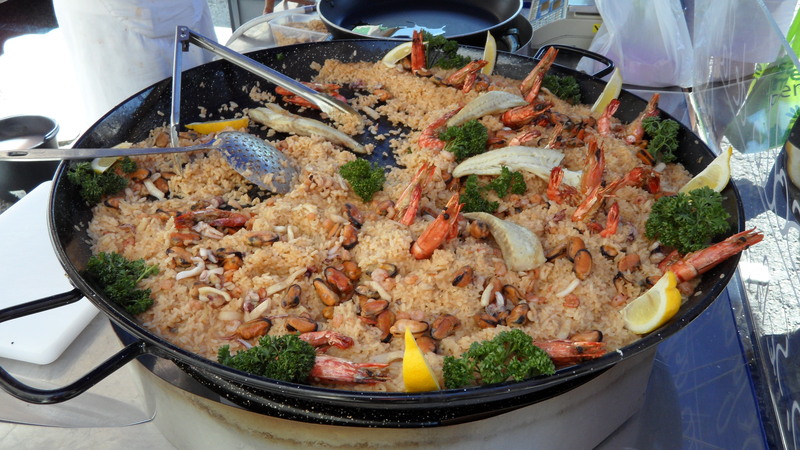 Steaming paella brimming with crevettes and mussels ready to take home or eat there. 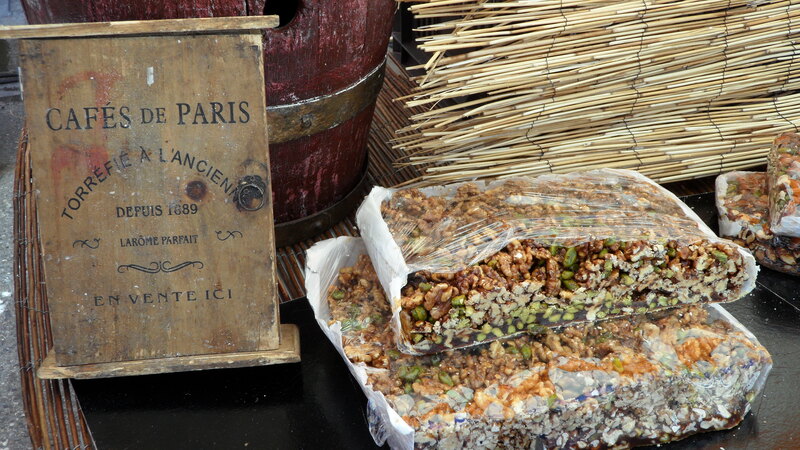 Provence is famous for its nougat which is crunchy from the nuts and soft from the caramelized sugar. Heavenly! Even after trying cheese, cookies, sausage, olive oil and more we still had room for lunch or diner. Le Festival is a lovely café situated right on the place and where we decided to park ourselves. 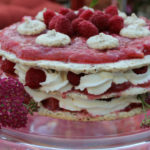 Our delightful and delicious meal was almost over shadowed by the visually stunning and mouth-watering desserts. 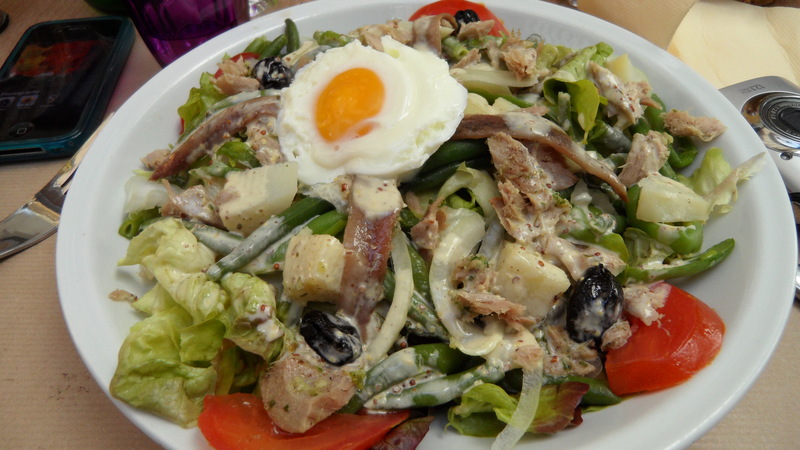 Salade Nicoise complete with fresh anchovies and a lovely poached egg. Salade Exotique. 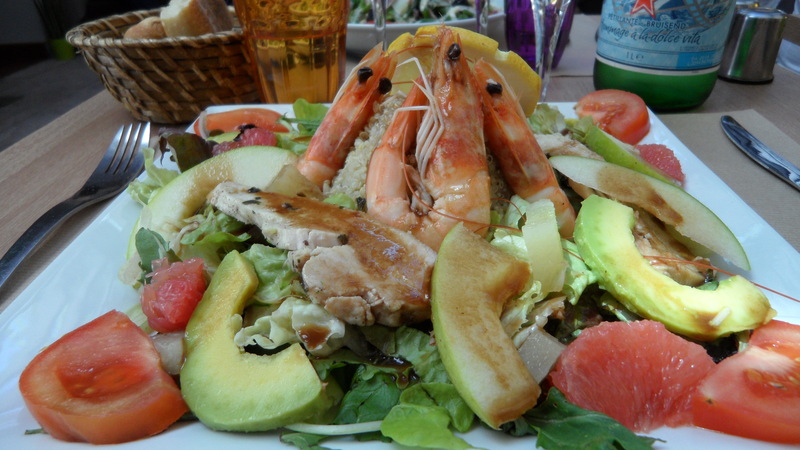 Chicken, shrimp, avocado, grapefruit, green apple slices, tomato and quinoa – so tasty. 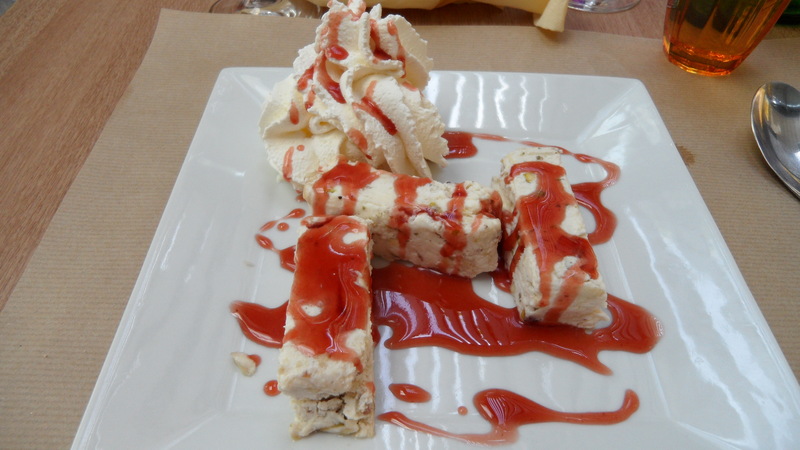 Nougat ice cream with crème Chantilly is visually stunning and tastes as bright as a ripe strawberries, the sugar dissolving in your mouth leaving the crunchy nuts to savor. THE best dessert so far hands down. 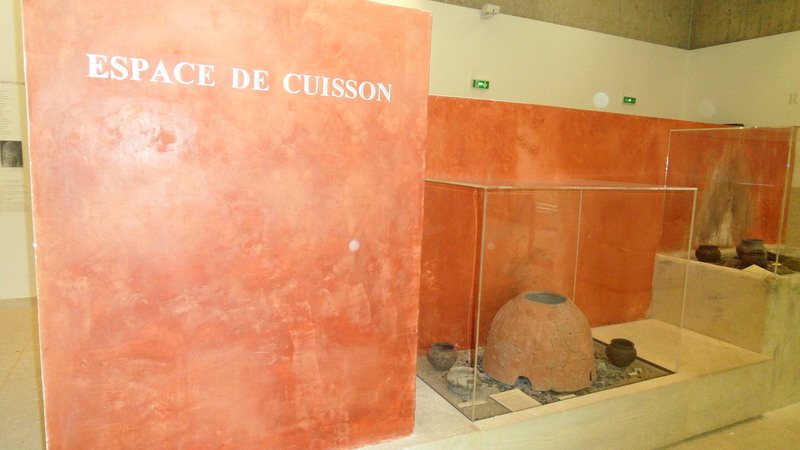 I love history and another highlight of Vaison are the excavated Roman ruins right in the downtown village where life long ago has been unearthed. 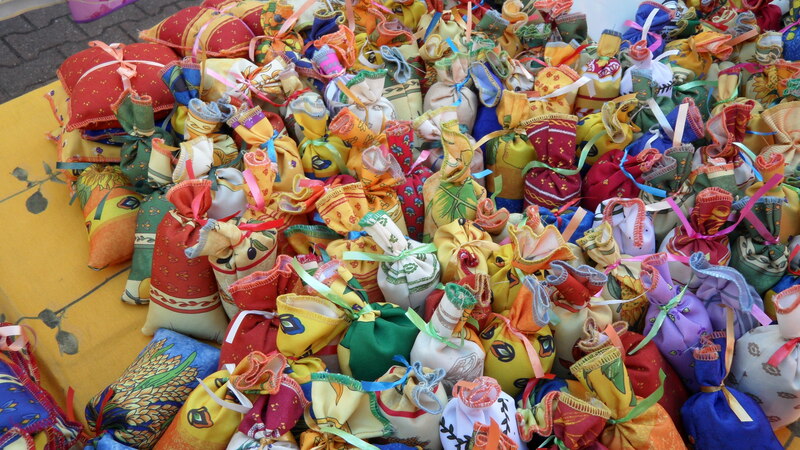 Artifacts, statues, mosaics and coins all reveal what life was like long ago. Excavated ruins of the home of a wealthy Roman family. How would you like to cook with the vessels and oven in this Roman kitchen? 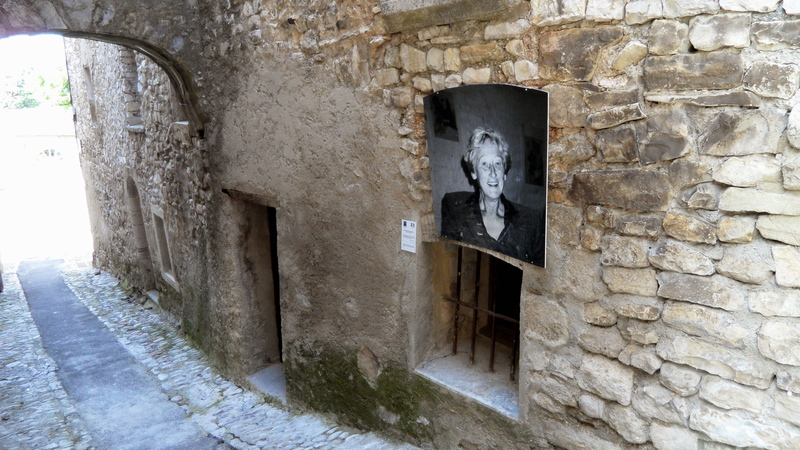 The Haute Ville, or upper town of Vaison la Romaine, is a residential Medieval district oozing with antiquity. 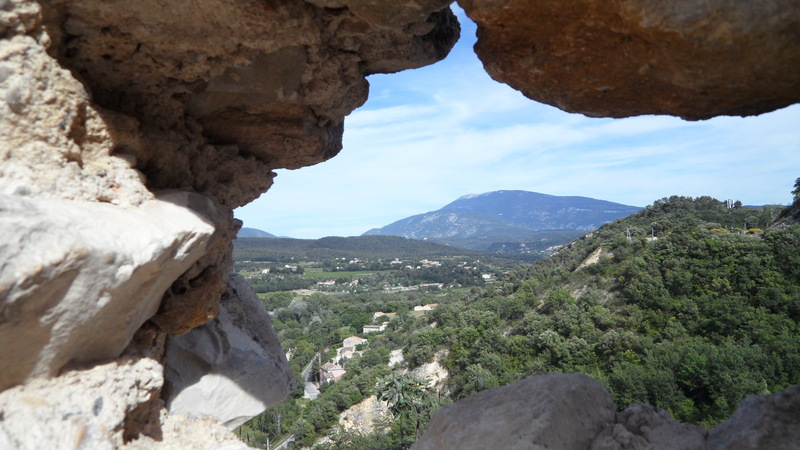 To reach it, we walked over a single arched Roman bridge, across the Ouveze River. 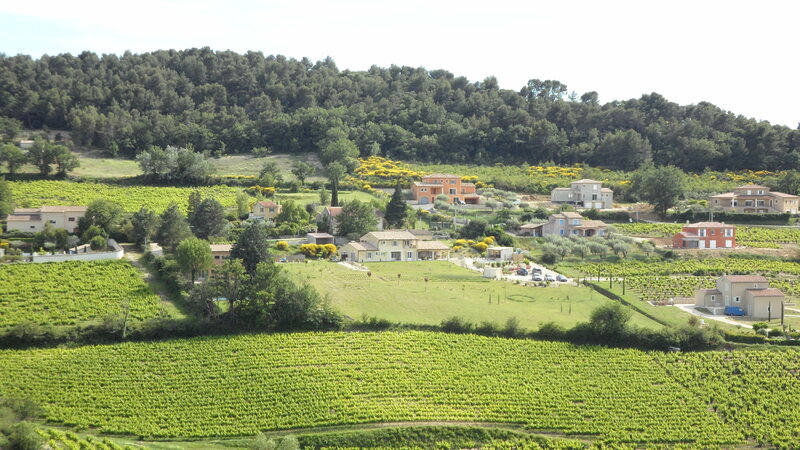 Haute Ville vista of the Vaucluse. 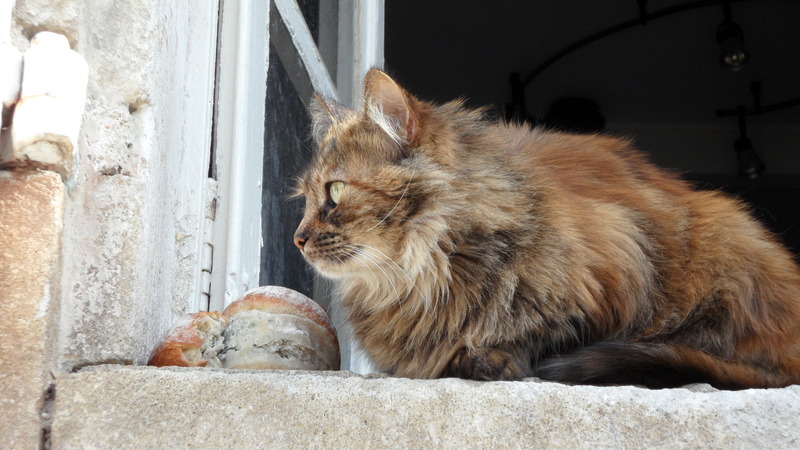 A curious kitty perched in a window sill eyeing the passer-byes. The upward winding cobbled streets emit an energy of tranquility. Here and there tucked into the walls, artists showcase their paintings and pottery. 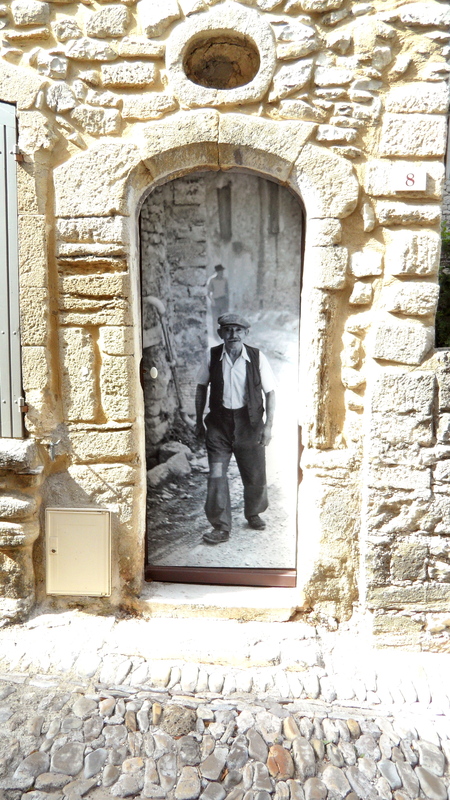 I was especially intrigued by the large photos of generations past around every corner. Images of the past become embedded in the present. These black and whites really add the charm to the narrow streets. 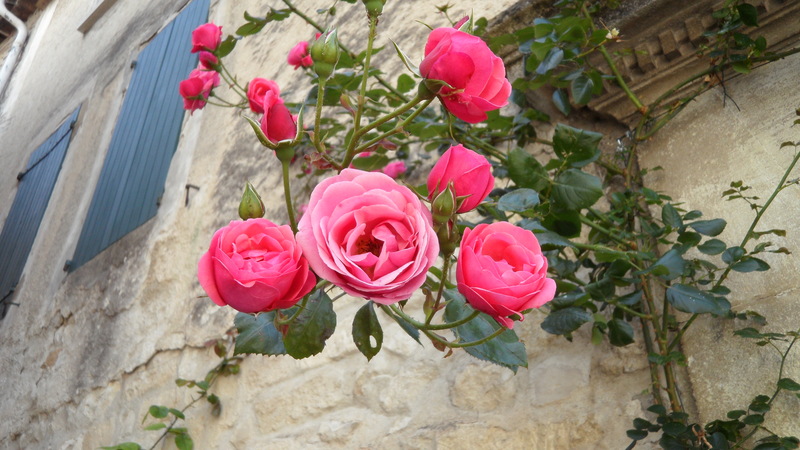 Such vivid colors brighten the stone entryways. 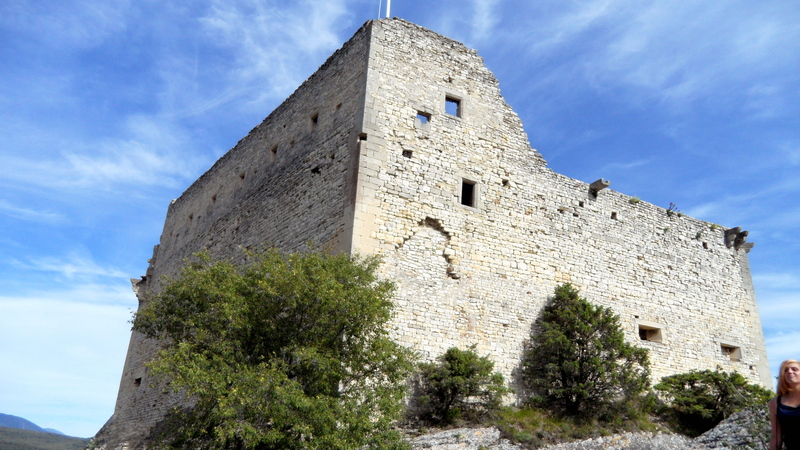 Remnants of the old castle, circa 13th century, sit high upon the Haute Ville. You must have a steady leg, traversing the rocks, to reach it but one you arrive the view is spectacular. The old castle still stands having seen many rulers throughout the ages. Peep hole view from the sky. Can you imagine having a view of the castle from down below? 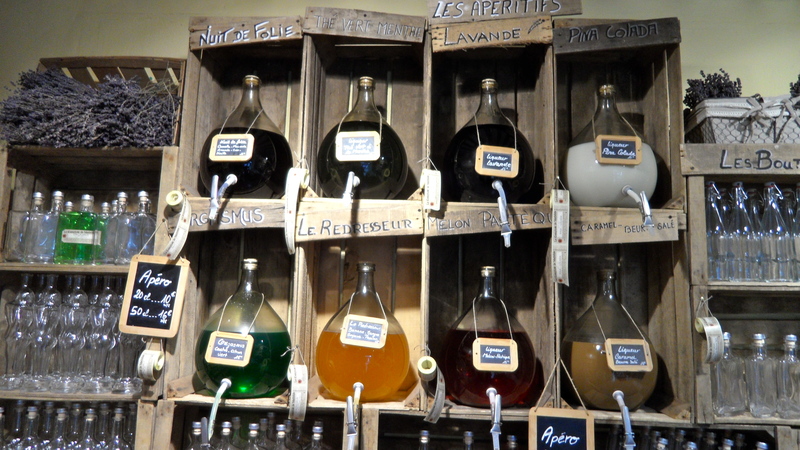 Crossing back into town we discovered a shop that sold local olive oils, balsamic vinegar and even pastis by the ounce. 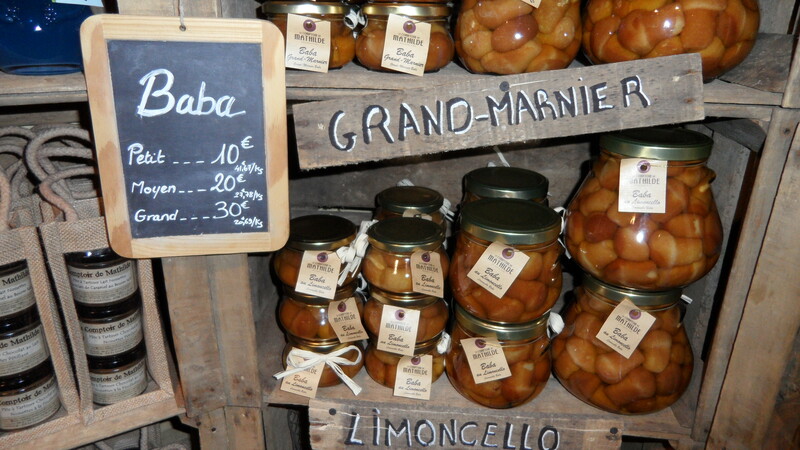 I’d never seen jars of Babas au Rhum – yum! A full day indeed again filling all my senses. 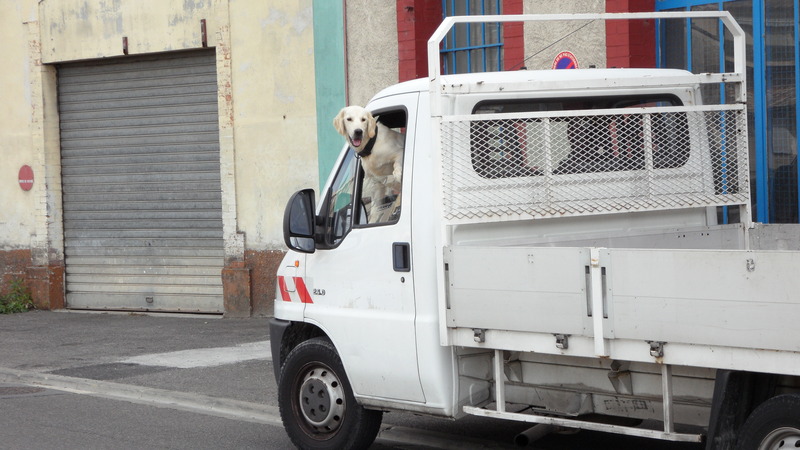 Here’s the au revoir from a happy dog greeting everyone who notices. Goldies love to make new friends! Happy dog, love it! Stunning photos, all of them! 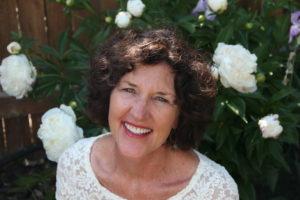 Your beautiful pictures have my mouth watering and stomach growling – wishing it was surrounding these delights. Oh my. What a treat for the tastebuds!